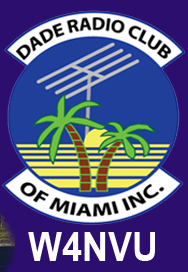 June 2011 Meeting Minutes – W4NVU – Dade Radio Club of Miami Inc.
Meeting was called to order at 19:55 with 24 present. Miguel presided over the meeting and welcomed everyone. Everyone took turns and stated their name and call sign. Miguel welcomed everyone again. It was good to see some old faces back. We celebrated Mother’s Day last month. Father’s Day is this Sunday. We have a quorum. Miguel reminded everyone present tonight to sign in. Miguel held a Director’s meeting. Ray was there. Robert was on the phone. They went over new ideas for the club. Corresponding Secretary – Virgil – picked up the mail and delivered it to Miguel. Miguel gave it to Esther. Corporate Secretary Joanne and Treasurer Esther worked together on the new membership roster. We have 30 active members. Voting members – 23; Complementary members – 7; and 22 Inactive members. Some are coming back. We will work to get more of them back. Treasurer Esther took in more dues tonight. We are going to have a 50/50 raffle tonight. Please get your tickets. Miguel has asked vendors to donate, but has not received anything from them. He is working on the inventory list and insurance forms. He got a list from Ray. Carl is working on his. Waiting to hear from Merritt. 147.760; 224.200; 1291.80 and 51.660 (UM) – Ray is not here tonight. Carl spoke about the 444.200. It’s operating well. Reception is working well. Merritt spoke about the 147.000. He has not heard of any interference. It’s working. Access is needed to the 760 and 200 at UM. Will contact Ray. Robert said the 220.000 is still at his house. It needs a new home. Field Day is the last weekend in June. June 25 and 26. Miguel will be there on the 26th. It will take place at the Agricultural Center located at SW 288 Street and SW 187 Avenue. Co-Hosted by the Everglades Amateur Radio Club. Food will be supplied. We will split the costs with them. Bring your own equipment and power supply. Start setting up at noon. Start transmitting at 2 PM. It runs for 24 hours to 2 PM the next day (Sunday). Miguel held a director’s meeting. Merritt provided information. Ray was there. Robert was on the phone. Got some ideas. There are 2 Free Fleas in April and November at UM. We are looking to have a picnic in October at Tropical Park if Carl can get the same spot as usual at the pavilion by the mound. Robert stated that the last time that we did it, we did a show and tell for the benefit of the public. We can set-up some stations and eat some BBQ. The club is sponsoring the food. Looking at a weekend day, either a Saturday or Sunday, in October. Oct 15, 16, 22 or 23. Carl will see which date he can get. Miguel wants to bring back some type of Hamboree in January 2012. Robert and Tom Morrison are on the committee. Harry will help. Might be like a free flea. Robert will look for a location. October 8 and 9th is the Melborne Hamboree. Robert spoke to the Richmond Coast Guard Station about Ham Radio. He offered to give us a tour of the place. Robert will find out a date. Next few months – here are some ideas – future demos; radio check night; Ernesto to do a light and sound demo; Ray to give us GPS training; get a tour of the training area building; a soldering demo, etc. If anyone else has any ideas, please see Miguel. Virgil announced that he is working on the By-Law revisions. He asked if there were any suggestions. Virgil, Dave and Carl are working on it. It will be put back on the agenda for next month’s meeting. Virgil announced that someone from Cape Coral, FL has a license from Columbia and wants to transmit here with an international call sign. He sent a letter. He wanted someone to respond. His request will be directed to Philipe. Merritt thanked everyone that participated in the MS 150 Bike Tour. Everyone did a great job. It was a very successful year. There are no other upcoming events at this time. January is the ING Marathon. Ryan is in charge of the website. He will give us a demo at the next meeting. We want to have a news letter and anyone that wants to post something can email to any officer and they can post it. Miguel asked if there was any other business. There was none. The 50/50 drawing took place. Virgil won $13.00. Congratulations Virgil! Ryan gave a very informative presentation on Slow Scan TV (SSTV). It was very educational. Thank you Ryan. Miguel thanked everyone for coming. A Motion to close the meeting was made by Dave, seconded by Harry. Voted and passed.